The time has come. You have the power to visit the year 1836 and the lost world of the Texas Revolution. Where augmented reality makes time travel happen. Using a reality board and your smartphone or tablet, you now have a window on an international legend. A reality that doesn’t tell you a story, but shows it with accurate, photo realistic reconstructions of the church and small garrison where the legend was born. You’ll see and hear the sounds of battle, along with a narrator who explains the saga, taking place before your eyes. A living textbook for history … authored by your curiosity. And if you’re a collector, don’t forget the Alamo trading cards. 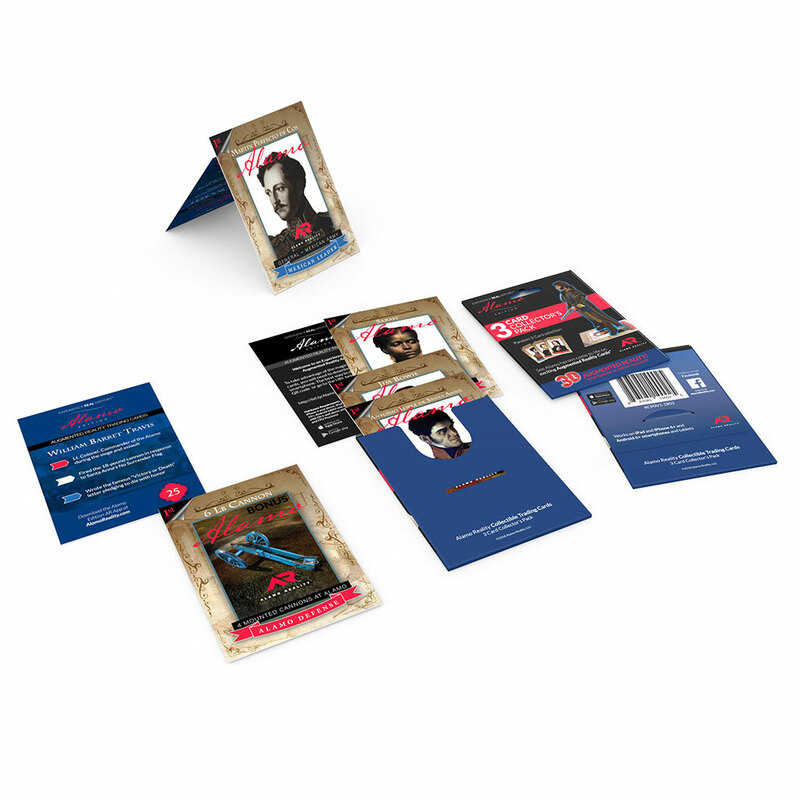 Each card … a miniature reality board, showcasing the people who lived the story. The time has come to explore a subject that would’ve taken hours to understand with a textbook. A subject that is now unpacked in seconds, as your eyes and ears make you a living observer to real history. Start the adventure! The Reality Board is a large mat with a printed image of the 1836 Alamo from a bird’s-eye view. When viewed with the Experience Real History – Alamo Edition app, your own personal Alamo diorama appears in front of you! See and hear photoreal animated scenes of the Alamo battle, explore the fort the way it was in 1836, and experience the personal drama of the people who fought and died at the Alamo. The Alamo Guidebook provides helpful instructions about using the Alamo App in addition to an informative map that shows the Alamo of 1836 overlaid present day San Antonio. Use this map when at the Alamo Plaza to see where the long lost parts of the Alamo were in 1836. Also included in the booklet is a short history of the Alamo to gain a quick understanding of the Alamo story. 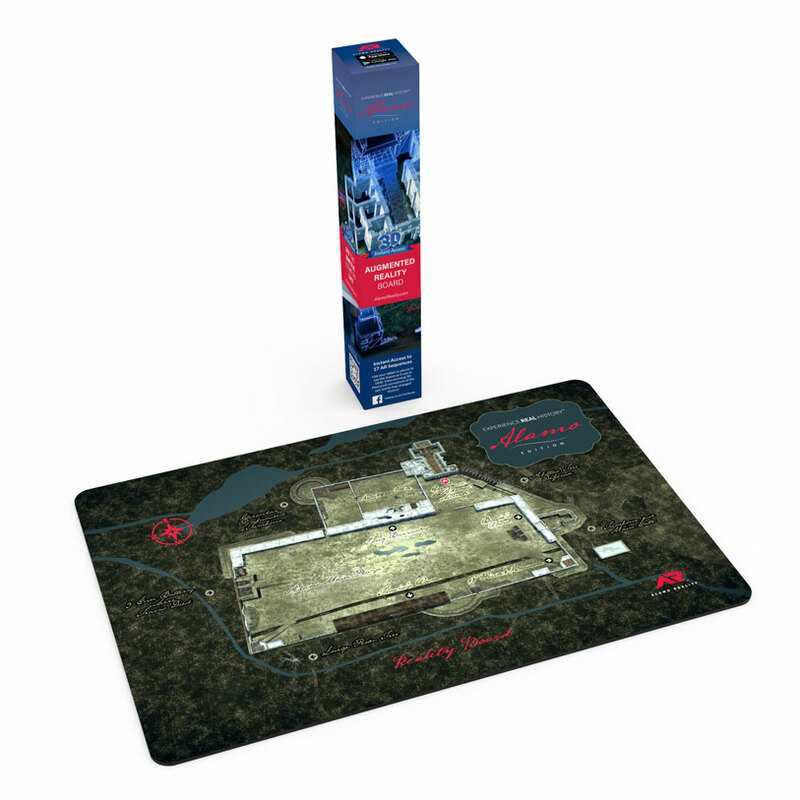 The Mini Reality Board is a mousepad sized mat with a printed image of the 1836 Alamo from a bird’s-eye view. When viewed with the Experience Real History – Alamo Edition app, your own personal Alamo diorama appears in front of you! See and hear 4 important photoreal animated scenes from the Alamo battle, explore part of the fort the way it was in 1836, and experience the personal drama of the people who fought and died at the Alamo. Davy Crockett, Martín Perfecto De Cos, Antonio López de Santa Anna, Jim Bowie, William Barret Travis, and SarahEach a card comes to life when viewed with the Experience Real History: Characters app. The historic characters spring into action while a narrator tells the story of their life. Additional biographical information is on the reverse side of the card providing additional educational value. Firing the virtual 6-lb Cannon. Using the Experience Real History: Characters app, focus on the cannon card then watch as the cannon and crew pop on top of the card and then shoot with smoke and fire. Take a screen capture of the card in action and post it to Instagram with the hashtag #showusyourcannon. Hear all the stories without disturbing your neighbors. The Alamo Guidebook provides helpful instructions about using the Experience Real History: Alamo Edition App, in addition to an informative map that shows the Alamo of 1836 overlaid present day San Antonio. Use this map when at the Alamo Plaza to see where the long lost parts of the Alamo were in 1836. Also included in the booklet is a short history of the Alamo to gain a quick understanding of the Alamo story. Firing the virtual 6-lb CannonUsing the Experience Real History: Characters app, focus on the cannon card then watch as the cannon and crew pop on top of the card and then shoot with smoke and fire. Take a screen capture of the card in action and post it to Instagram with the hashtag #showusyourcannon. See Alamo heroes come to life! 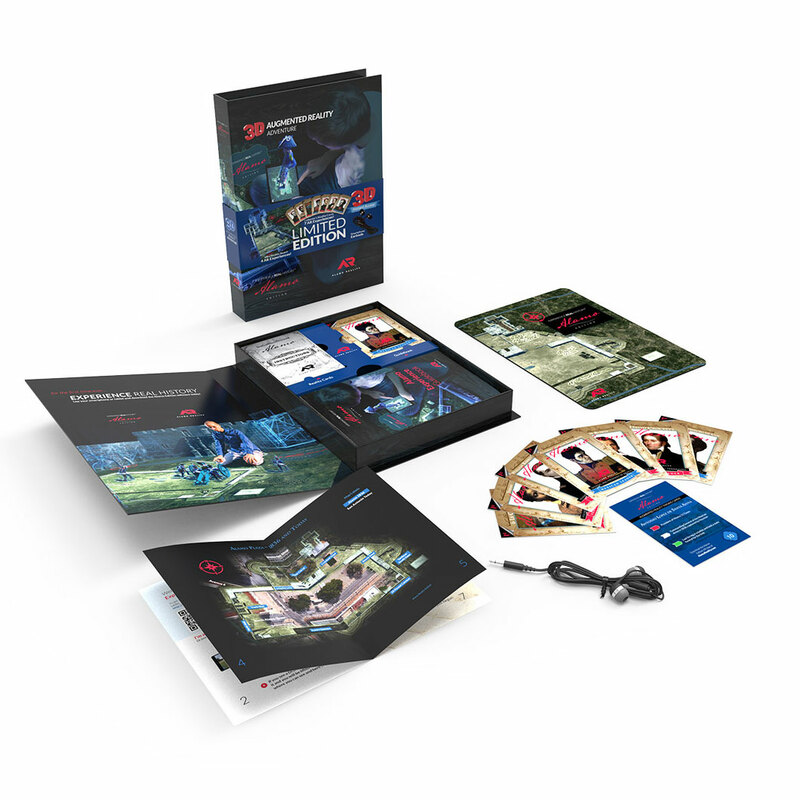 The 3-Card Collector’s Pack includes 3 random cards with unlimited access to AR experiences. Cards available: David (Davy) Crockett, Martín Perfecto De Cos, Antonio López de Santa Anna, James (Jim) Bowie, William Barret Travis, Sarah and The 6lb Cannon. You will need to download a free app for your device. Experience Real History, LLC, a San Antonio, Texas based education technology company, develops an array of fun and exciting historical products for the retail and educational markets under the Experience Real History (ERH) brand. 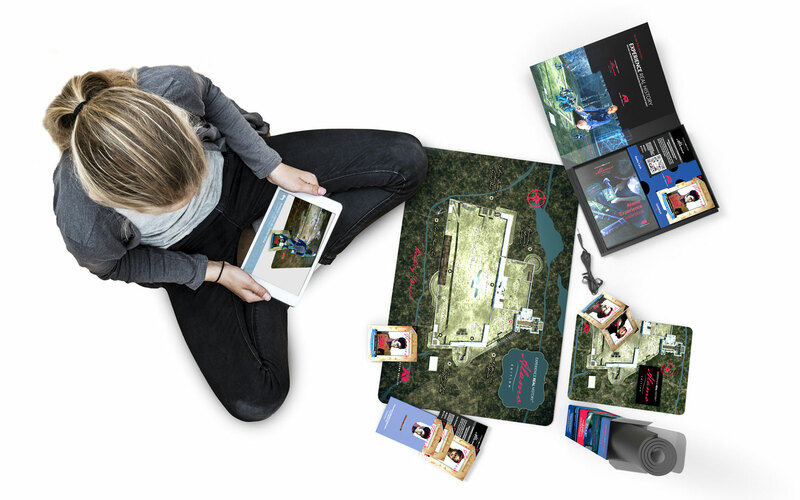 All products utilize innovative Augmented Reality to bring historical destinations and figures to life. 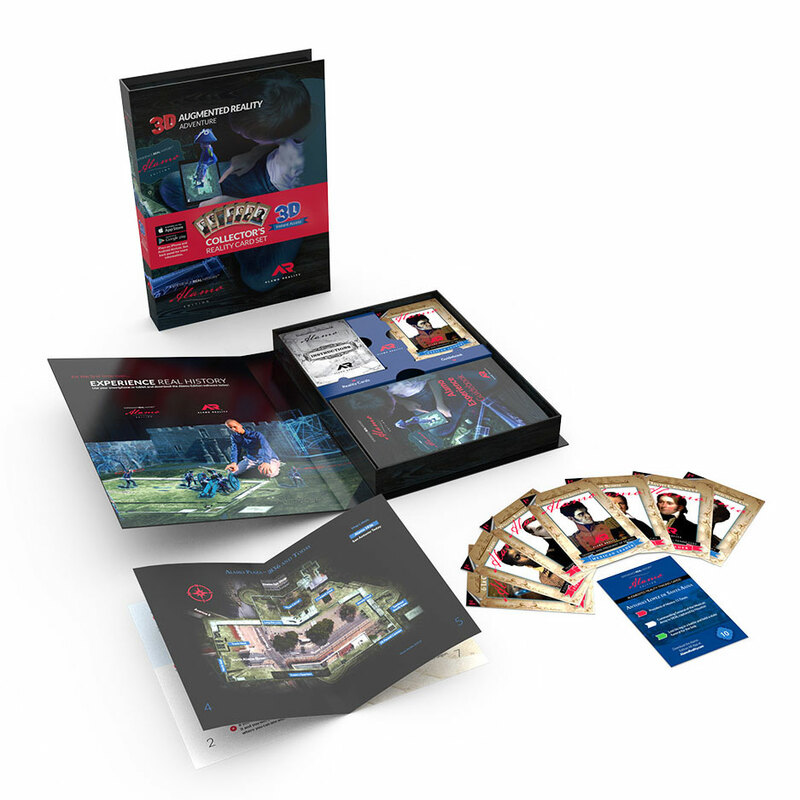 Products include interactive Augmented Reality collector’s trading cards, Reality Boards™, puzzles, figurines, coasters and books, with additional products currently in development. In addition to physical products, the company develops downloadable Apps for mobile devices that allow users to travel back in time in history to see and hear what life was like. Experiences include traveling back to 1836 at the Alamo. Users are able to navigate wherever they want to go to virtually explore places in history – many that no longer exist- and learn fascinating information along the way. Additional content allows the user to access additional written and video content that can be used by educators and school systems. Curriculum level lesson and games to be released soon. 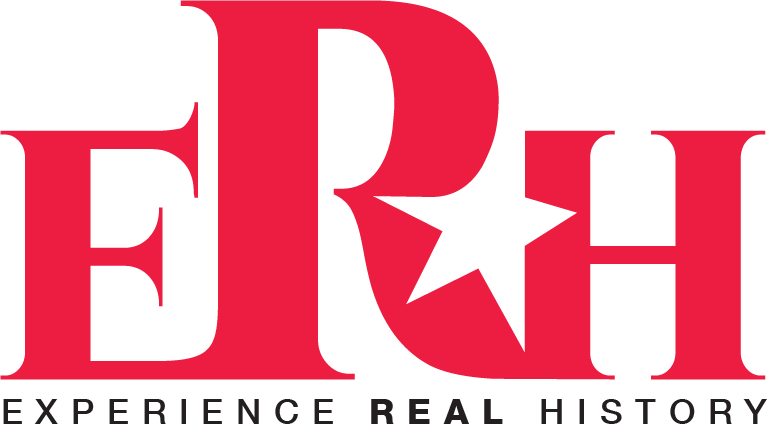 Experience Real History, LLC selected industry leader, RR Donnelly, to assist with manufacturing, Third Party Logistics (3PL), distribution and freight to manage a portfolio of products for Experience Real History’s ERH brand. The selection was based on the firm’s reputation and its ability to provide a cohesive solution. The company’s expertise includes, but is not limited to, the ability to manufacture and source a wide range of products via their network of worldwide partners. ERH is currently being produced in various plants throughout the United States, Mexico and Asia. The 3PL function manages all product storage, pick/pack and shipping in the United States and can expand Globally as demand grows in those respective markets. Transportation is a key element to controlling cost for a retailers and consumers, as such Experience Real History, LLC has corporate agreements in place to assist Brick and Mortar retailers small and large with their transpiration needs as requested. Manage 230 facilities in the United States occupying more than 17M sq. ft.
Own/Manage more than 90 international facilities, encompassing approximately 6.7 million sq. ft. primarily in Asia, Europe, Canada and Latin America. ISO 9 001:2000, ISO 13485:2003, FDA Registration, GMP, Quality audit every 6 months, Internal ISO audit every quarter, Continuous Improvement Program, and Full Disaster Recovery Protocols. EHS concepts incorporated into management and facility design, ISO 14001 certificate, FSC certified, and OC 080000 certificate. OHSAS 18001 certified,	EHS safety standards, and RR Donnelley corporate standards. REACH,	CONEG, and EU Packaging Directive. RR Donnelley’s EHS Policy informs and guides our Sustainability Leadership Committee, an internal multi-discipline team responsible for reviewing and approving initiatives relating to our Sustainability Strategy. RR Donnelley has earned Forest Stewardship Council (FSC) "Chain-of-Custody" (CoC) certification and SFI/PEFC CoC certification at over 140 worldwide locations. Our supply chain capabilities include vendor managed inventory (VMI), just-in-time delivery, systems integration, logistics, sourcing, quality assurance, tracking & traceability and performance management. All continually optimized to reduce inventory, obsolescence and working capital. Experience Real History's Experience Real History brand has the capability to ramp production level in the millions in less than 8 weeks from time of order to your stores or D/C’s. Orders below half million will take 6 weeks, orders under 5,000 can be filled out of inventory. Please fill out the form below and someone will contact you with 24 hours to provide quantity pricing information.